It’s Thursday! It’s also my first day at work this week thanks to the long holiday weekend. 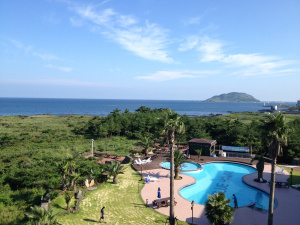 I spent four glorious days taking in as much sun as possible while staying on beautiful Jeju. It was a heavenly weekend, and I returned home feeling relaxed and genuinely happy. Hotel view. I love having balconies. Sitting in the fresh air and taking in the sunshine.